No snake charmers here, just a native perennial that is worth a try in a garden as a tall statement piece for pollinators! Rattlesnake Master is full of surprises. It looks like it belongs in a desert, but it is actually a native prairie plant that grows well in the midwest. While its basal foliage resembles that of a yucca (lily family), it is actually a member of the carrot family, Apiaceae. It's flowers are a pollinator dream and its height adds something unique to the garden. The plant begins with prickly, stiff basal foliage. The bluish-green blades are coarse and thick with parallel veins and occasional prickly edges. The leaves are up to 1.5 inches wide, 2 to 3 feet long. From within this foliage grows a towering stem up to 5 feet high! 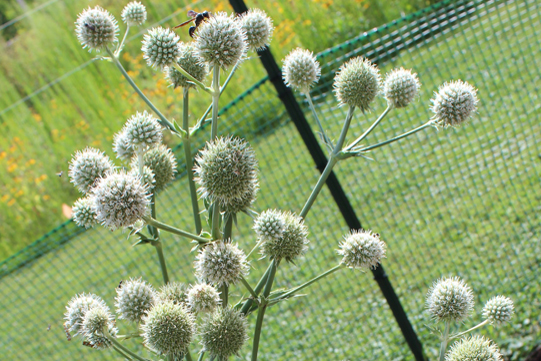 Unlike its umbel-flowered cousins in the carrot family, Rattlesnake Master's flowers are spheres! Surprise! The greenish-white flowers are tightly-packed into 0.5 to 1 inch globes and bloom from mid to late summer (June to September). These perennials do not transplant well due to a taproot, so think carefully before landing these pillars in your garden. Pick a site in full sun. It is not one for partial shade. It prefers well drained soils and can tolerate dry sites but does not do well in standing water. If you avoid shade and wet feet, it is considered easy to grow. The one in the garden pictured below nearly died when we got the little transplant, and look at it now! The flowers have a strong sweet scent ("sickly honey" was one description) and the pollinators were all over them. These flowers attract a bumper crop of insects. This weekend it was covered in tiny sweat bees, mason wasps, honeybees, beneficial predatory insects, and TONS of colorful ailanthus webworm moths (beauties in their own right). Another bonus- while it may be attractive to insects, the coarse, sharp foliage and prickly flower spheres are not considered very palatable to our common mammal pests... and so these MAY receive fewer (we can never promise zero) unwanted bites from munching deer or groundhogs.